We have been enjoying Kolcraft products since my kids were wee infants and I am excited to showcase their recent MLB products for my holiday review. Mason is now the active little toddler at 16 months today. He is climbing everything and doesn't have a worry or fear. He also watches Kenzie and imitates her. 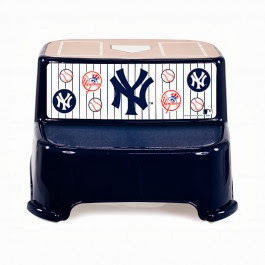 The MLB Yankees step stool ($14) is great for toddlers who are starting to become a bit more independent. It's made of durable plastic with my favorite MLB team's logo artistically placed. I love that there are two steps to reach higher counters. The rubber anti-skid grippers keep the step stool in place so that it doesn't slide around. I also like that the top is textured for allowing little feet to have better balance without toppling over. Although it is recommended for tots 18 months and up, Mason has no problem using this step stool as well as sitting on it and carrying it around, imitating Kenzie with her step stool (which is a wee bit lame because Hubs was the one who purchased it). She tries to swap out with Mason but he will not allow it! The price is reasonable with free shipping so make sure to pick up several. During the holiday hustle and bustle when you are out and about, it is nice having a lightweight umbrella stroller handy in the car for quick use. When I took the MLB Yankees stroller ($29) out of the box, I was surprised at the size. Since I don't have a classic umbrella stroller, I thought that it would be flimsy yet cute. Boy was I wrong. It is pretty durable and tall for people like my Hubs to push around without any hunching over. You can easily keep this in the trunk to use at anytime since it only weighs about 7 pounds and folds down small. 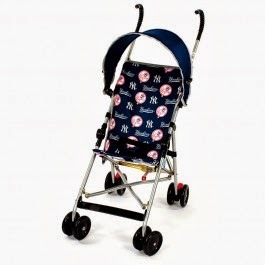 A nice feature is the canopy which is usually not present on a small umbrella stroller. This is a must have since I am sun phobic and want all the protection for the kids' skin. The 3-point safety harness will keep your tot safe while giving them freedom from the usual 5-point as they get older. 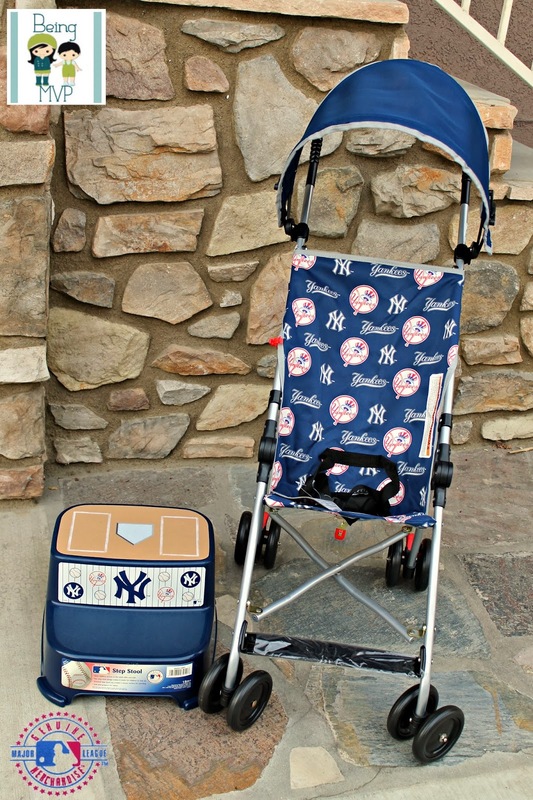 You can use this stroller up to 35 pounds and since Mason is about 23, he will have some good times in it. Kolcraft also offers coordinating potty seats which will be great for Mason soon. Kenzie is determined to teach him to go potty that I am thankful to her for her anticipated help. Haha. Do your older siblings like to help out? we are huge baseball fans in our house! i wonder if they have marlins too! That is such a cute step stool! We could really use one for my grandson's bathroom, but with the Atlanta Braves logo on it! i love the stepping stool! This would be totally great in our home!